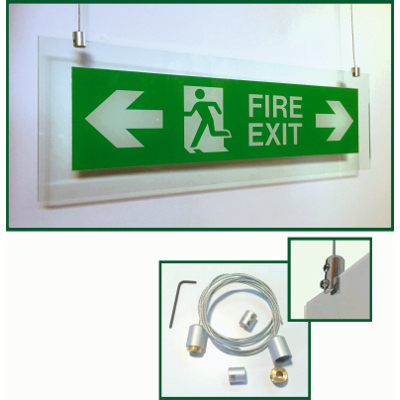 A hanging Acrylic Fire Exit Sign (green edge/glass effect), complete with hanging clamps, stainless steel cable and ceiling fixings with BS Standard legend. These can be either single or double sided legends. 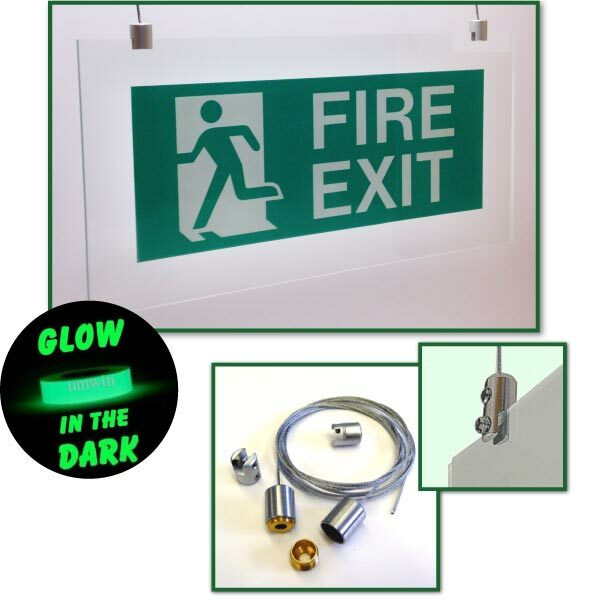 A hanging Acrylic Fire Exit Sign (green edge/glass effect), complete with hanging clamps, stainless steel cable and ceiling fixings with BS Standard legend. 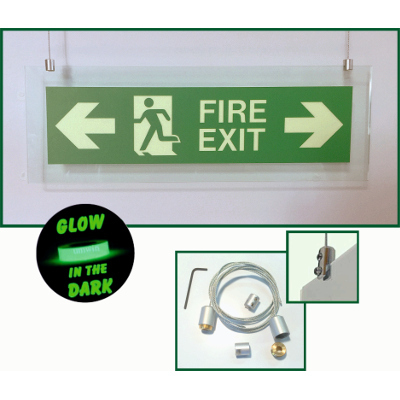 A hanging Photoluminescent Acrylic Fire Exit Sign (green edge/glass effect), complete with hanging clamps, stainless steel cable and ceiling fixings with BS Standard legend. 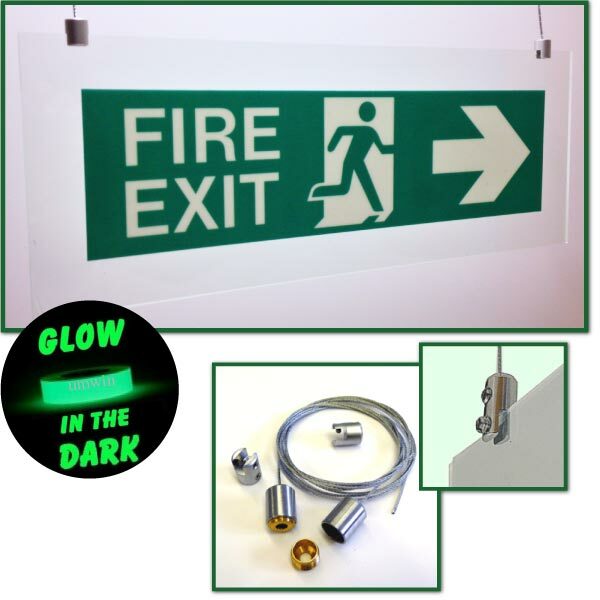 A Photoluminescent Acrylic Fire Exit sign - (green edge/glass effect) wall mounted, complete with chrome or black stand off wall spacers, screws and chrome or black coverhead caps, with BS legend. Please click on "Buy Now" to use drop down menu for fixings choice. 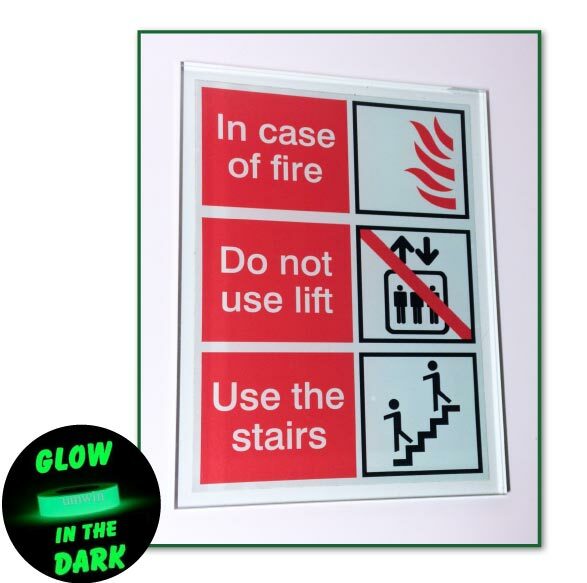 A polished Acrylic Photoluminescent Fire Extinguisher sign (green edge/glass effect), indicating extinguisher type and usage, complete with self adhesive foam backing strips. Size: 200mm x 75mm. 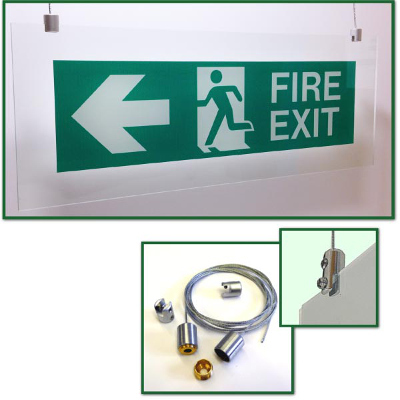 Extinguisher types available: Water, CO2, Foam spray and Dry powder. 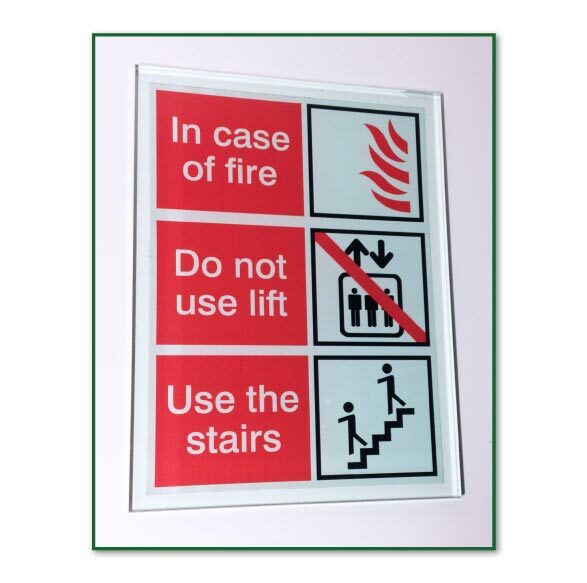 Please click "Buy Now" to use drop down menu for choice of extinguisher. 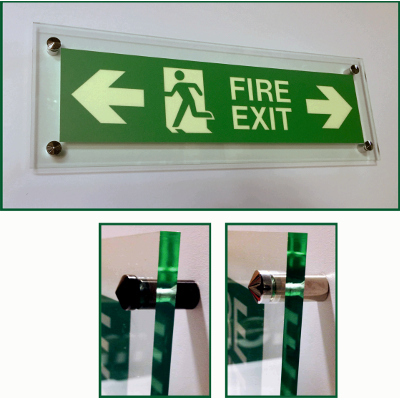 A polished Acrylic Fire Extinguisher sign (green edge/glass effect), indicating extinguisher type and usage, complete with self adhesive foam backing strips. 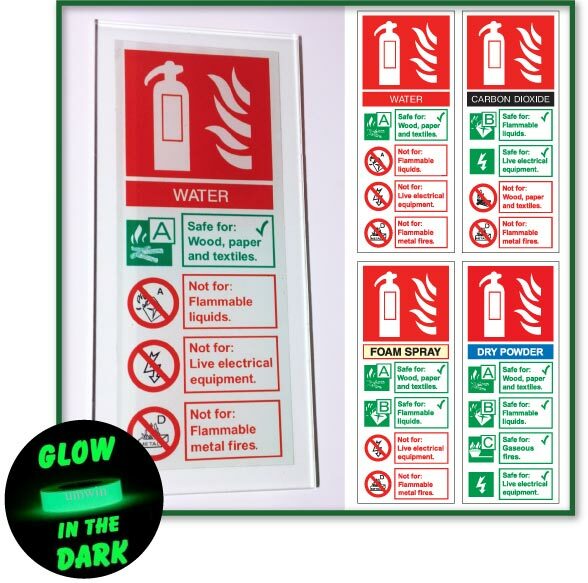 Please click "Buy Now" to use drop down menu for extinguisher type. 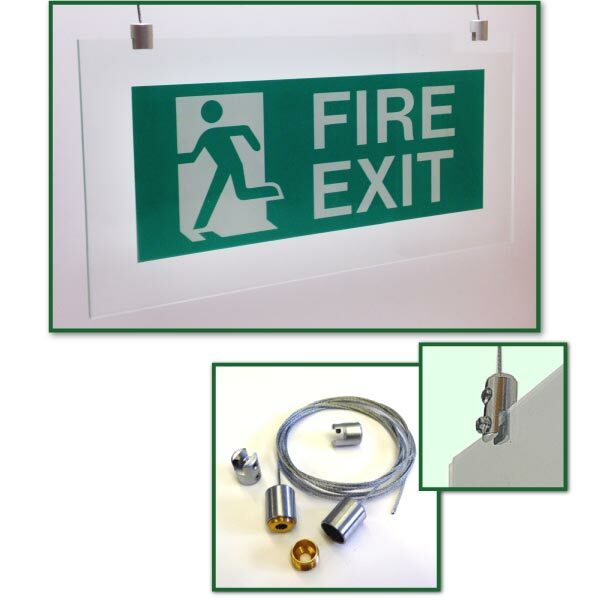 Contemporary, Glass Fire Exit with Arrow sign, in 6mm toughened glass with polished edges complete with chrome or black spacers and chrome or black coverhead screws. Please click "Buy Now" to use drop down menu for arrow direction and to select fixings. 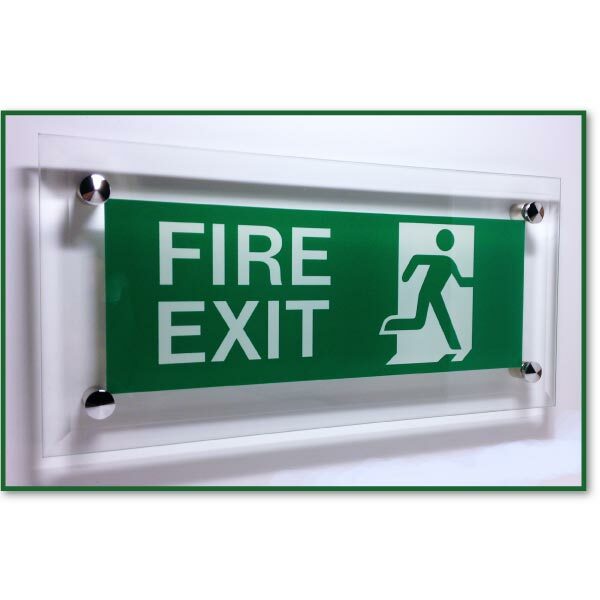 Contemporary, Glass Fire Exit sign in 6mm toughened glass with polished edges, complete with chrome or black spacers and chrome or black coverhead screws. Please click "Buy Now" to use drop down to select fixings. 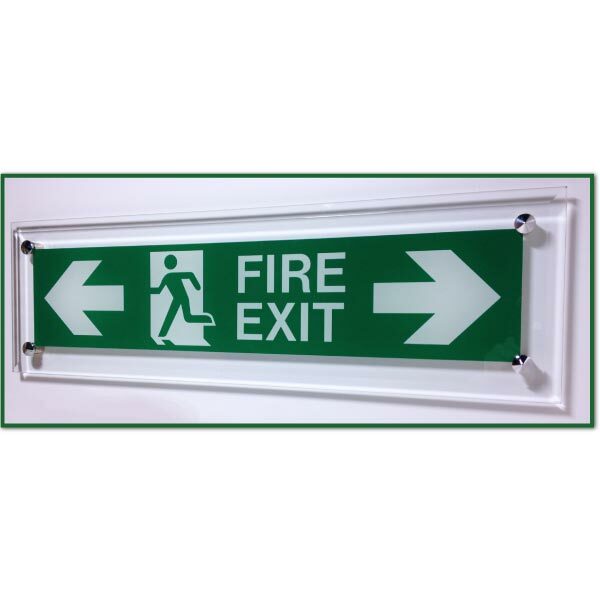 Contemporary, Glass Fire Exit Double arrow sign in 6mm toughened glass with polished edges, complete with chrome or black spacers and chrome or black coverhead screws. Double Arrow. Please click "Buy Now" to use drop down menu to select fixings. 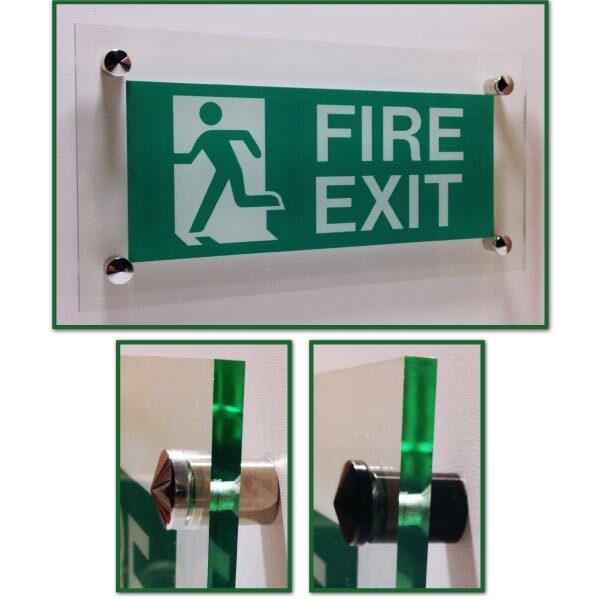 Acrylic Wall Mounted "In case of fire" sign, 5mm thick green edge, glass effect acrylic. 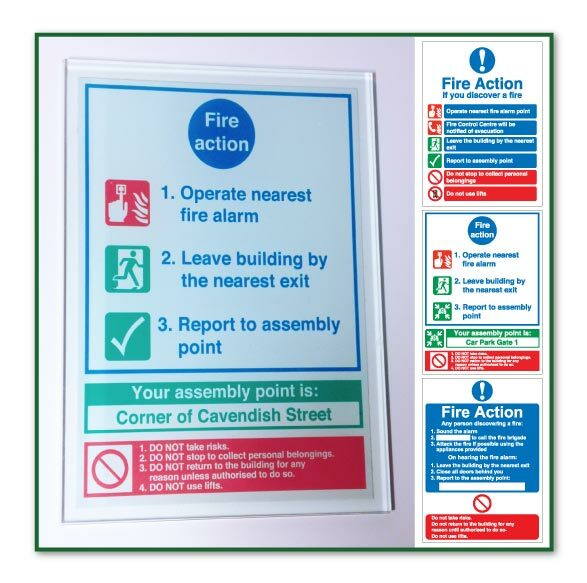 Size: 200mm x 150mm, with self adhesive. 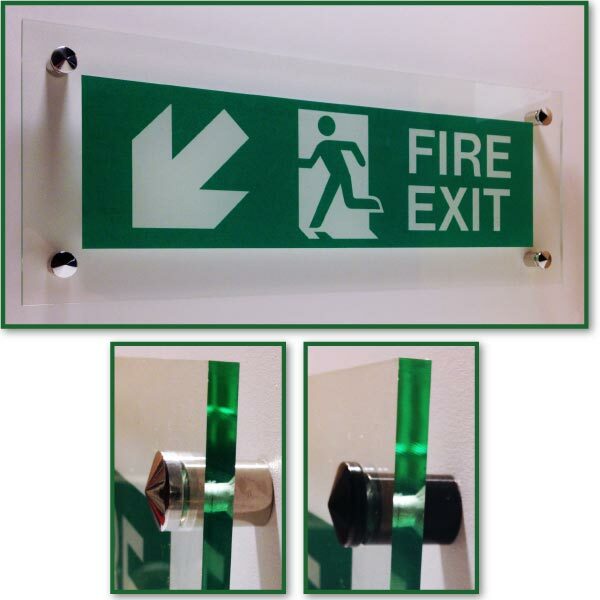 Photoluminescent Acrylic Wall Mounted "In case of fire" sign, 5mm thick green edge, glass effect acrylic. 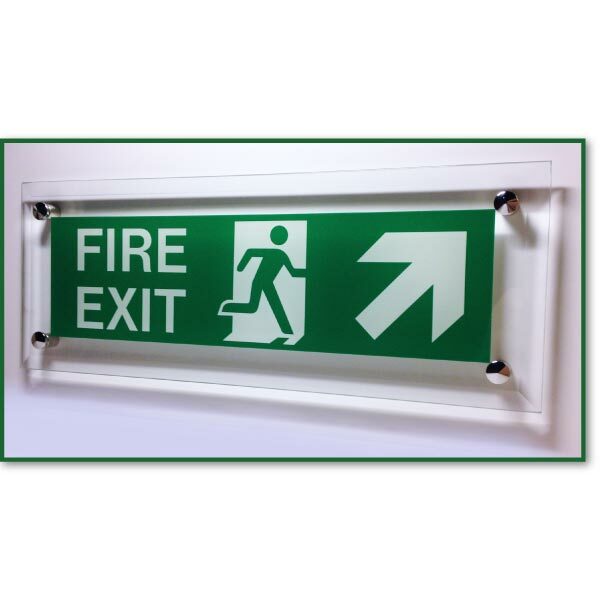 Acrylic Wall Mounted Fire Action Sign, 5mm thick green edge, glass effect acrylic. 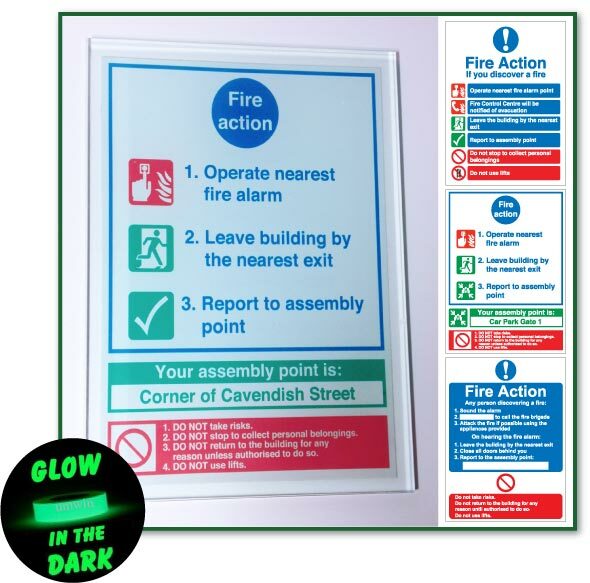 Size: 200mm x 150mm, with self adhesive. Available with or without assembly meeting point. Please click on "Buy Now" for further options. 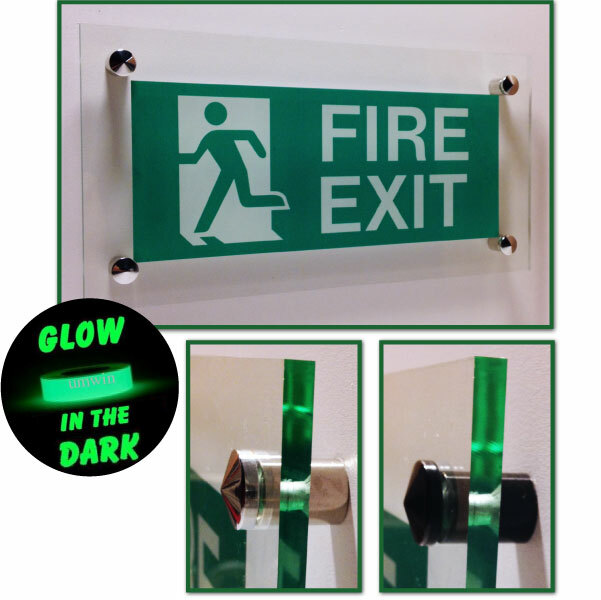 Acrylic Wall Mounted Fire Action Photoluminscent Sign, 5mm thick green edge, glass effect acrylic. With self adhesive backing. Available with or without assembly meeting point. Please click "Buy Now" to use use drop down menu. If you wish us to print a specific meeting point please advise details.